For most softball fans, five hours and 48 minutes sounds like the length of a doubleheader. But for St. Scholastica head softball coach Jen Walter, that's a bike ride. 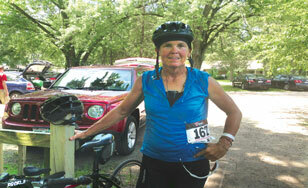 In July she completed the Century Ride for Crohn's & Colitis in Southern Kettle Moraine, WI - a 100-mile bike ride that raised money and awareness for The Great Bowel Movement, a charity that aids people with Crohn's Disease and Ulcerative Colitis. Crohn's is an incurable bowel disease that causes inflammation of the digestive tract, resulting in a number of gastrointestinal problems. People with the disease can look healthy and normal while suffering severe pain and other complications. "I became interested in Crohn's during one of our many bus rides last spring, when Sydney Gordon, a first-year player, talked about the challenges she faces in dealing with Crohn's," Walter said. "I'd always wanted to do a century ride, so I looked up rides that benefited Crohn's and signed up." After eight weeks and well over a thousand miles of training, Walter beat her time goal for the ride by 12 minutes, and raised over $1,400. "I was able to cross something off my bucket list while helping a good cause," Walter said. "It was my way of showing support." And after finishing, she rested, right? "I picked up my campsite and drove about seven hours to Sioux Falls (SD) to recruit (at) a softball tournament."